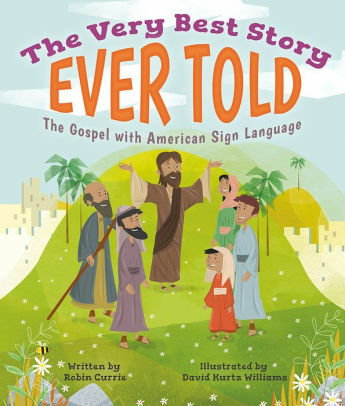 Summary: This book tells the gospel story through an engaging retelling that involves the senses of seeing, hearing and movement with American Sign Language. Literary elements at work in the story: Each beautifully illustrated spread in this book contains a story from Jesus’ ministry beginning with his birth and concluding with the Holy Spirit and work of the disciples. The simple sentence structure is easy to understand for children and would be a good book for early elementary readers. The text can stand alone without the use of sign language, but the sign language enhances the story and brings it to a new level of learning. How does the perspective on gender/race/culture/economics/ability make a difference to the story? The illustrations convey the nature of Jesus’ middle eastern ethnicity and culture throughout the story. The illustrations on each page created to teach different ASL motions use both a Caucasian male and an African American girl. These illustrations use both simple word instructions and pictures to teach the motions and build on each other as the story continues. Theological Conversation Partners: This book could be used to teach children the gospel narrative to be told through ASL in its entirety or used to teach it one story at a time, such as the story of Jesus healing the blind man or feeding the five thousand, both of which are featured in the book. It begins with God’s love for us. It could be utilized in a classroom, children’s worship, or a time with children in a worship setting should time allow. To couple this story with the scriptures that coincide with the narrative would strengthen children’s ability to comprehend the stories we hear through the scriptures and to be engaged in them as well. This text does not end with the resurrection of Jesus but goes on to talk about the disciples and how we are called to tell of the gospel as well, this is a real strength when many texts for this age stop at Jesus’ resurrection. Which story of Jesus’ life is your favorite to hear and why? Which ASL motion did you like learning the best and why? In your own words, can you tell the story of the gospel? How do you think the adults in the temple felt when they met Jesus as a boy? How do you think the blind man felt when Jesus healed him? What do you think he told his friends? Pretend you are a person in the crowd of 5,000 people? What do you see, hear, and smell? The story tells us that Jesus taught his disciples to pray? Do you know what he taught them? Let’s say it together. How would you tell the story of Easter to a friend? What are some things that we do today that Jesus taught us or did when he was alive? What does a disciple do and how can you be a disciple too? Thanks to Union Presbyterian Seminary alumna Loren Tate Mitchell, associate pastor at Covenant Presbyterian Church, Roanoke, VA, for writing this book review. The Very Best Story Ever Told: The Gospel with American Sign Language by Storypath is licensed under a Creative Commons Attribution-NonCommercial 4.0 International License. Thanks for experiencing the book fully!